How to create a Google Analytics master dashboard for all your clients? Wouldn’t it be great if you could see all of your clients’ performances together? Well, you can do this easily with DashThis. To start with, when you create a report, you have to connect data sources to it. In the case of a master dashboard, you would select your clients’ Google Analytics profiles. By default, when there is more than one Google Analytics profile, the data will be combined. So let’s say Profile A has 2 visits and profile B has 5. The resulting KPI will show 7 visits. 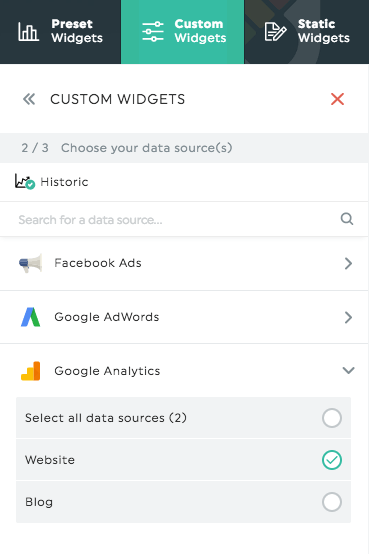 Using the custom widget menu, you can create KPIs using only one data source. So you would create a KPI for Profile A and another KPI for Profile B. They would then show 2 and 5 visits respectively. And this is not only for Google Analytics, but all other data sources like Facebook Insights, Adwords, YouTube and so on. This entry was posted in Integrations and tagged Adwords, Facebook Insight, General, google analytics, youtube. How to create a Lead Generation Report template for Adwords? How to create an executive dashboard for Google Analytics?